In order to enhance the successful rate of skin transplantation, tie-over method and occlusive dressings were investigated using the skin of hairless dogs. Tie-over method had no accelerative effects of the skin grafting of hairless dogs. In contrast, at 2 weeks after grafting, the graft skin has taken well under the moist environment. The hydrocolloid dressing accelerated wound healing in the donor sites. In both the graft and the donor sites, wound contraction and crust formation were not found throughout the study, although the skin of hairless dogs lagged considerably behind that of other haired dogs in wound healing. At 2 weeks after the skin grafting, histologically, the epidermis of the grafts showed thickening and irregular hyperplasia with prominent rete ridges, suggesting a relatively high rate of cell proliferation and/or differentiation. In the dermis, the formation of granulation tissues was found, and neovascularization was obscure. At 4 weeks after skin grating, the epidermis remained thick and hair follicles with well-developed sebaceous glands were observed in some portions. In the donor sites, at 2 weeks after the treatment with hydrocolloid dressing, there was reepithelialization arising from the wound margin. In the dermis, dense granulation tissues containing many fibroblasts and collagen fibers were formed. At 4 weeks after the treatment, the regenerated skin exhibited a remarkable thickening of the epidermis, especially the granular layer, and well-developed rete ridges. These findings revealed that the treatment with the hydrocolloid dressing was a valuable measure in accelerating graft take and wound healing in the donor sites of hairless dogs. Background: Glucocorticoid therapy remains the mainstay of treatment in pemphigus vulgaris although controversy exists about the optimal regiman. This study was conducted to compare the efficacy of routine oral prednisolone with high dose intravenous glucocorticoids in treatment of pemphigus vulgaris. Methods: A total of 55 patients with pemphigus vulgaris was enrolled in the study. The diagnosis of pemphigus vulgaris was confirmed histologically. The patients were divided into two groups: Group A (26 Patients) was treated with high-dose intravenous glucocorticoids and group B or control group (29 patients) was treated with routine oral prednisolone. Both groups were followed for at least 20 months after initiation of treatment. Results: The results showed complete clinical cure (without relapse in 20 months follow up) in 81% of cases in group A and in 69% of cases in group B (p<0.05). The mean + SD prednisolone daily dose during the 20 months follow up after initiation of treatment was 12+0.38 for A and 15.3 + 1.33 for control group (p<0.05). Tinea capitis is a dermatophyte infection of the scalp the purpose of this study was to define the demographic features, clinical patterns and associated symptoms and signs of tinea capitis in Saudi Arabia. All patients who attended the dermatology clinic of king Fahad Hospital of the University (KFHU) at Al-Khobar, Saudi Arabia and who were diagnosed as tinea capitis between January 1991 and December 2001 were reviewed. The collected data were analyzed using statistical package for social sciences (SPSS). A p value of less than 0.05 was considered as the statistical level of significance. The patients with tinea capitis composed 0.14% of the study population and male to female ratio was 1.8:1. The mean age at presentation was 6.4 + 5.2 years. The most frequent sign was alopecia and the predominant morphological type was the non inflammatory tinea capitis. Micorporum canis was the predominant dermatophyte followed by Trichophyton violaceum. Topical tretinoin, a retinoid long in use for the treatment of acne vulgaris, has the disadvantage of skin irritation. Adapalene, a third generation retinoid, has been claimed to have less side-effects. We evaluated the safety and efficacy of adapalene in an open uncontrolled trial. Thirty three patients of mild to moderate acne vulgaris were included in the study. Of them, 22 patients completed the study period of 12 weeks. The mean age of all 33 patients was 19 year with male to female ratio of 1.75:1. There was significant decrease in lesion count in each of 1,4,8 and 12 weeks evaluations (p <0.05) in both inflammatory and non-inflammatory lesions. About 70% complained of burning, 60% of itching and 30% of dryness. However, none of the side-effects was severe enough to stop the medication except in one case. Diabetes mellitus is a chronic metabolic disorder occurs due to deficiency of insulin or insulin resistance. It leads to various metabolic abnormalities. It affects various tissues cardiovascular system, nervous system, eyes and skin. Following study was done to assess the various cutaneous manifestations of diabetes mellitus, to know associated skin disorders with diabetes mellitus, to understand the cutaneous complications following diabetes mellitus and its therapy. Fifty patients of diabetes mellitus with cutaneous manifestations attending skin and STD department of Vijayanagar Institute of Medical Sciences, Bellary, were selected for the study. They were subjected to relevant investigations. In our study NIDDM was noticed in 86% of cases. Cutaneous infections were the commonest cutaneous manifestations accounting for 70% of the cases. Fungal infections accounted for the majority of infections. Two cases of Achard Thiers syndrome were the interesting observation. One hundred cases of urticaria were studied to find out the etiology and to detect any co-relation between etiology and clinical manifestation. In 59% cases an etiological factor could be detected and the diagnosis was more certain in acute cases. In more than two-third of cases of chronic utricaria, the etiology could not be detected. Type and distribution of the lesions did not suggest any particular etiology except in the cases of physical and cholinergic urticaria. Trichofolliculoma is a congenital malformation with an excess of hair which are usually increased not only in number, but also in length, thickness and pigmentation. The tumor may be multiple, and is usually located on cheek and nose, but may be seen in other areas as well. We present a case of trichofolliculoma on scalp in a 17 year old boy, presenting as a small papule that had a bunch of fine, white hair. 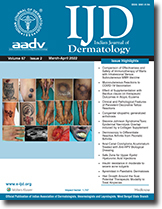 Several types of cutaneous lesions are described in association with diabetes. Spontaneous bulla is a characteristic type of skin lesion that is rarely seen. Only about 100 cases have been described in the literature. We report an unusual case where the lesions developed spontaneously, on both great toes in a symmetrical distribution. Venous lakes are bluish-purple, soft swellings, less than one centimeter in diameter, commonly seen in elderly persons over sun damaged skin of lower lip or ears. An unusual finding of venous lakes over upper eyelids in two sisters in young age is described showing its genetic trait. An eighteen year old female patient presented with pitted scars over her face, back and flexures, associated with discrete comedones over her trunk, face and extremities of 5 years duration. There was history of similar lesions in her mother since her adolescence. Examination of mother and daughter revealed reticulate flexural hyperpigmentation over neck, axillae, cubital and popliteal fossae in addition to the above mentioned findings. A few cystic lesions were also present on the back and flexures. Dowling-Degos disease in mother and daughter is reported for its rarity and also for some additional features present in these patients, i.e., multiple comedones on the back and extremities in addition to the flexures and also extensive acneiform scarring all over the face in contrast to perioral pitted scars reported in earlier cases. Actinomycotic mycetoma of the anterior abdominal wall with inguinal lymphnode involvement, an exceedingly rare entity is described here with mycological histological features. Remarkable therapeutic response was noted with Welsh regimen. Cryptococcosis is one the emerging mycoses, given the context of the ongoing human immunodeficiency virus (HIV) pandemic. Disseminated cutanous cryptococcosis with obvious involvement of the central nervous system is described here, with the aim of emphasizing the importance of histopathological examination in the diagnosis of HIV related dermatoses and to highlight the fact that cutaneous cryptococcsis may be a harbinger of neurological involvement. A case of hyper-IgE syndrome in a 6 year old boy with bronchial asthma is reported here with the various manifestations of multiple tender abscesses of the scalp, recurrent dermatophyte infections of his face and right thigh, eczematous lesions of his neck, shoulders and antecubital fossae, candidiasis of the tongue, angular cheilitis and total dystrophy of his right bit toe nail. Laboratory investigations revealed staphylococcus aureus infection of the scalp, Trichophyton rubrum infection of the face and the thigh and candidal onychomycosis. Immunological survey revealed markedly elevated serum lgE level.